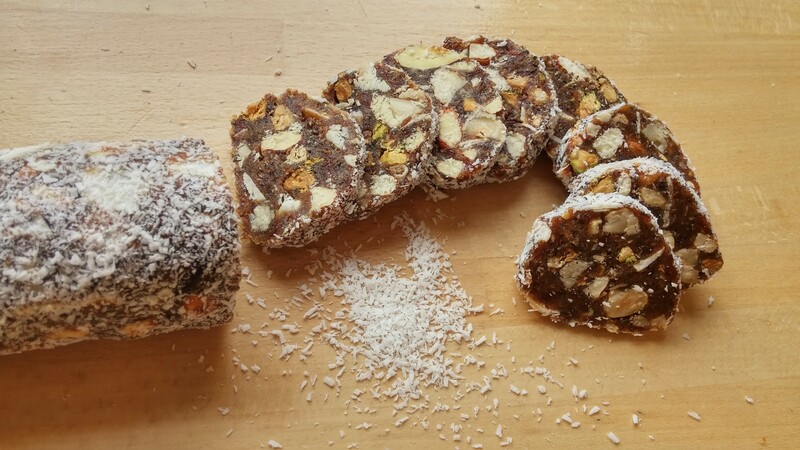 So these coconut date roll slices have been on my mind for quite some time now. They’re super easy and quick to make, and have I told you how addictive they are? I won’t tell anyone if you finish them all at once. Plus, I can assure you that this coconut date roll is one of the easiest and rewarding treats to make. So comforting, summer or winter, they taste great all year round, and have a rich nutty aroma that will leave you wanting more. 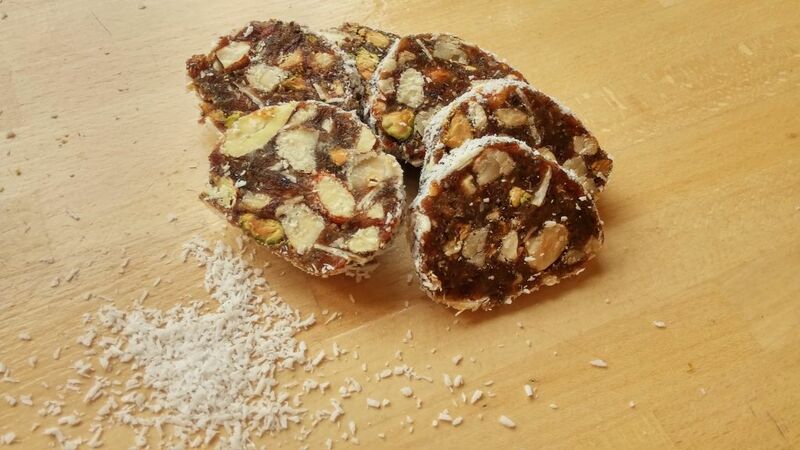 These thin, delicious slices of roasted nuts and dates, rolled in coconut, every bite is like a drop of heaven in your mouth. First, start by roasting the pistachios, almonds, cashews and hazelnuts for about 5 – 7 minutes in the oven at 356 degrees F (180 degrees C). When you notice that they release a strong nutty aroma, and slightly change color, take them out of the oven to cool, and roughly chop them up. Next, ground the flax seeds in a food processor, then blend the medjool dates to a paste texture. Finally, add the roasted nuts and chia seeds and give it a couple of pulses. Make sure not to blend the mixture, we want to be able to see the nuts when we slice the roll. Roll your mixture into a sausage, then roll in the coconut flakes and freeze for a couple of hours to set. So, what do you think? I’d love to hear. Stay tuned for more quick and easy no bake recipes here. I have to make it!!!!!! It looks so easy!! !